1. Place the bulgar wheat in a saucepan with 600ml cold water, bring to the boil and simmer for 15 minutes until the water has been absorbed and the grains are tender. Tip into a large serving bowl and leave to cool. 2. Meanwhile, for the dressing, whisk together the yogurt, tahini, lemon juice, garlic and enough water to give the consistency of single cream. Transfer to a serving bowl and sprinkle over the sumac. 3. Stir the tomatoes, cucumber, radishes, herbs, allspice and pomegranate seeds into the cooled bulgar wheat. Serve with the tahini dressing. 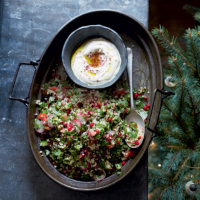 Serve as a buffet of Boxing Day salads alongside Garlic & Chive Flatbreads and Simple Warm Potato Salad. This recipe was first published in Fri Oct 30 14:36:00 GMT 2015.